Lightly grease a 15 cup-capacity (3.75 litre) freezer-safe glass bowl with the oil and place in the freezer for 1 hour. Pour the chocolate into the cold bowl and rotate to coat the bowl evenly. Return to the freezer for 1 hour or until set. Turn bowl upside and cover with a warm tea towel. Slide the chocolate dome from the bowl and set aside in a cool place. Preheat oven 160ºC (325ºF). Place the flour, baking powder, sugar, butter, eggs, milk and vanilla in the bowl of an electric mixer and beat until smooth. Pour into a lightly greased 30cm cake tin lined with non-stick baking paper and bake for 1 hour 15 minutes or until cooked when tested with a skewer. Turn cake out onto a wire rack to cool. Add a few drops of green food colouring to the butter icing and mix until well combined. Secure the vanilla cake to a cake board using a little icing. Using a small knife, cut a round from the centre of the cake, leaving a 3½cm border, and discard. Spread cake with the vanilla icing and fill the centre with the mixed lollies. 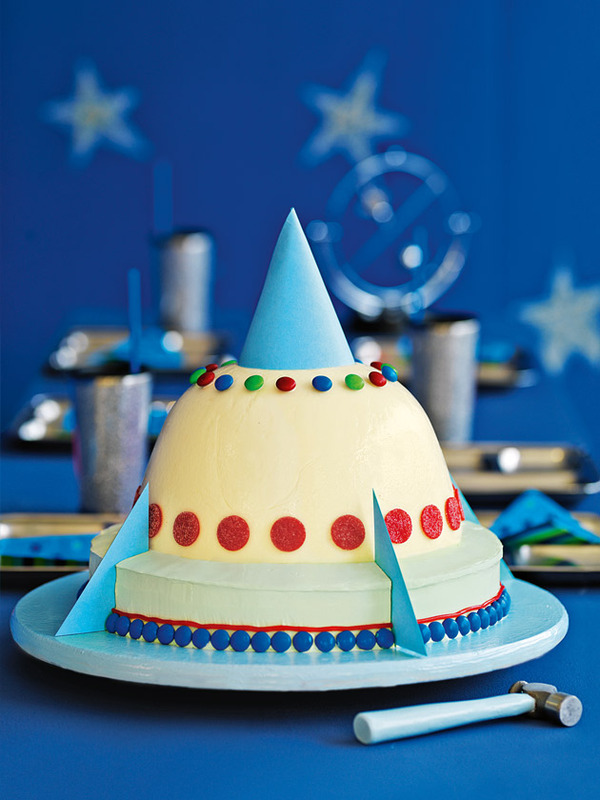 Top cake with the white chocolate dome. Using the melted chocolate, fasten the candy-coated chocolates and fruit strap rounds onto the dome. Decorate the base with more candy-coated chocolates and the red licorice laces. Top with paper cone and attach wings. Serves 8–10.